Swimming is a very useful life skill that can help a person in many ways. It’s a good idea for parents to make sure their children learn how to swim, and there are many things a parent can do with their children to help them learn from an early age. 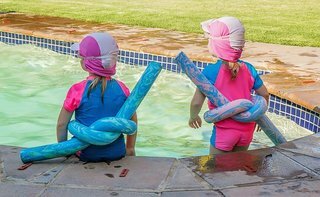 Before teaching kids to swim or doing anything in or around the water, you need to make sure you take proper safety precautions. Even learning how to swim does not stop a child from drowning. Make sure you know the proper way to act in case of an emergency. You should be familiar with child CPR. Never take your eyes off of your child, even if there is a lifeguard present. Before they can swim themselves, make sure you are always within touch distance of your child. 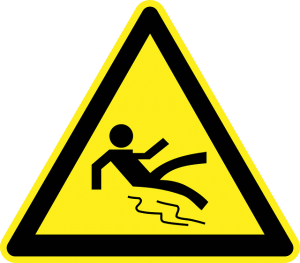 If you have a pool in your own house/yard, make sure there is no way for your child to crawl, walk, or climb in on their own unsupervised. A locked fence, several feet high is a good idea. It’s a good idea to establish a specific swimming outfit and emphasize that the child can’t swim unless wearing it. This way they are not tempted to go swimming in their normal clothes, which can be hazardous. With very small children, make sure you have a water-worthy diaper to maintain water health. Never force a child into a situation where they are clearly upset. All children learn at different speeds and in slightly different ways. Be patient and positive. Pediatricians seem to agree that any real teaching of swimming shouldn’t begin until the age of 4 (see below). Until then though, parents can help children become comfortable in the water. Parent/infant swimming classes are popular, so you might look one up in your area. If there are shallow steps leading into the pool, this is a great place to allow your child to explore a bit. You can sit together splashing hands and feet and reaching for toys, above or below the water. One of the biggest things parents can do is help children to be OK with water on their face. For small children, the idea of putting their face in the water is very scary. In order to swim well later in life though, they will have to conquer this fear. Parents can help this process during water play. When at the pool or in the bath, gently sprinkle small amounts of water in your child’s face or down their head. 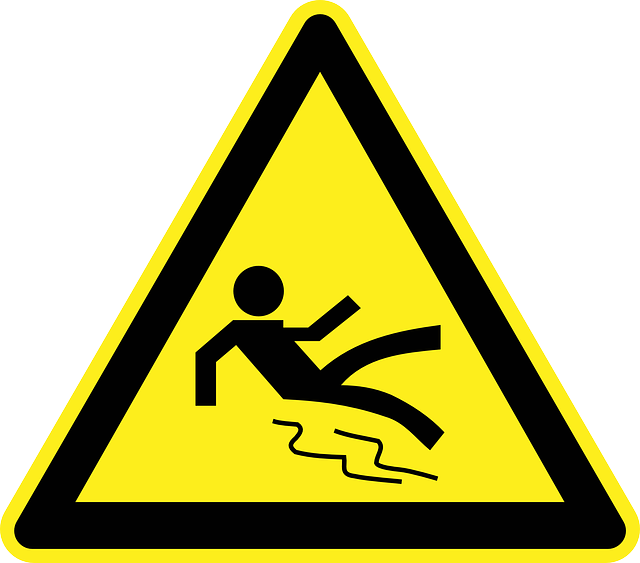 Be careful not to do too much, as you don’t want them to ingest large amounts of water. Now, your child will probably not enjoy this exercise; the key is for you, the parent, to remain calm and smiling. Very young children learn how to act in society by watching others’ reactions. This means if you worry and make a big deal over it, they will think water on their face is a bad thing and become more upset. So you have to show them it’s no big deal and that they’re fine. Parent’s can also help their young toddler get use to moving through the water. Holding your child firmly under the shoulders and around the waist, but keeping the child’s head supported above the water, slowly walk around the pool. This way they get a feel for the sensation of moving through the water. When they’re a little older, you can help them to understand breathing by showing them how to blow bubbles in the water. It’s a good idea to start with making sure your child understands how to hold their breath above water first. When they have this skill, you should exaggerate breathing in and then blowing out in the water to make bubbles. Invite them to do the same, if you believe they will not swallow large amounts of water in the process. 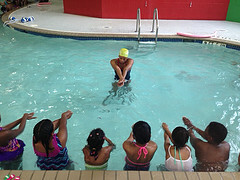 Four years old is generally believed to be the age when children can start absorbing lessons on how to swim. During this time, they should learn some basic skills to prepare them for learning strokes later. A great first skill to start with is how to move themselves along the wall of the pool, in a scooting/crablike fashion. This helps them know that the wall is a safe place they can go if they feel uncomfortable. It can also help boost their confidence in the water as find they can move themselves through the water. One of the most important skills to learn here is how to float. This is another skill that many children find scary, but it is essential for later skills. Floating shows a child can relax in the water, and is a useful safety skill until they can propel themselves well. Start teaching this by supporting the child laying on their back in the water. The goal is to get them as relaxed as possible in this position and reassure them they will be OK. As they appear comfortable, lessen your support. In some cases, as they feel your hands leave, even a little, they will tighten up, causing them to sink. Remain very close to them so you may support them again if this happens. You must remain reassuring and encouraging, but don’t force them past their comfort threshold, as you want to enjoy the activity. A similar procedure will also work for learning to float on their stomach. Another important skill is timing their breathing. You want to make sure they take breaths above water, and then hold or blow out while under. A great activity for this is bobbing. Start slow with one bob, and again exaggerate taking a deep breath, going under, and then taking another big breath when you come up. As the child masters this, you can have them do increasing numbers of bobs at a time. You may also begin working on kicking. This can start with the child floating on their stomach while holding onto the wall. As they get older, you may switch to a kick board so they actually propel themselves. It is important to make sure they learn the correct way of kicking. Kicking is not the most energy-efficient way of propulsion, and if done improperly can be more of an energy drain than an asset. Make sure their legs are almost fully straight, with only a slight bend at the knees. The motion should come from their hips, not their knees. Once your child has mastered the basic skills in the last section, they are ready to start learning proper swimming strokes. At this point in time, it is often time to enroll them in formal swimming lessons to ensure they learn the proper technique for the different strokes. There are several online resources to help you know how to teach your child to swim. Uswim.com is a great site with skill progressions for different age groups. Each skill has a video and lesson plan for the parents to use. And it’s free. This site has many different activity suggestions for different age children. The writing isn’t the greatest, but there are some really good ideas for how to teach skills. David Penland also has several good videos demonstrating how to teach several key skills. 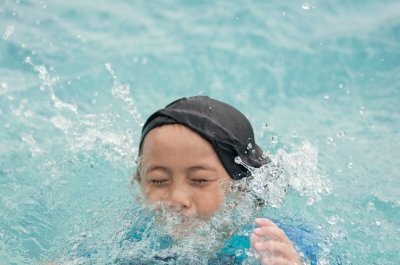 Have you taught/would you teach your children to swim? What have you found to be most effective?